We took on the entirety of this project – designing and building garden walls to innovatively use this steeply sloping garden. It was a project that took a huge amount of planning and preparation – and when the planning permission came through, our team only had 12 weeks in which to complete the entire project before the client was hosting a 21st birthday party in the space. Our team worked six days a week non-stop to make sure the garden was ready for our client’s party – over 500 tonnes were excavated, and 200 tonnes reused to create this innovative use of space. To our clients’ delight the project even came in under budget. If you would like to discuss options for reinventing your garden or outdoor space with garden walls, contact our team today using the form on the right. 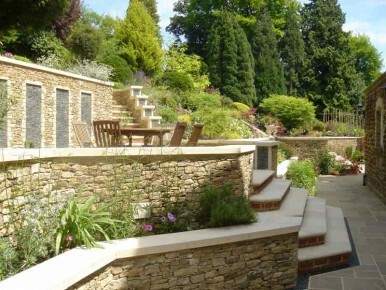 We will be happy to discuss different types of garden walls and designs to suit your needs.